The article below compares medication administration between paper-based medication administration (PBMA), i.e. the traditional method and bar-code medication administration (BCMA). Unfortunately, as is the case with much of the literature in journals these days, the information is quite old. The data for this observational study was collected in two short spans in 2008 and 2009. The numbers are small, but interesting nonetheless. The results pan out as expected. Items of particular interest were that the nurses in the BCMA groupd spent more time talking to their patients compared to the PBMA groupd, but at the same time spent a heck of a lot more time on drug prep. The first item makes sense, but I’m struggling to understand the drug prep numbers. The article can be found in the May 2012 issue of Hospital Pharmacy. It is is available for free with registration. Bedside Barcode Technology: Impact on Medication Administration Tasks in an Intensive Care Unit. Hosp Pharm 2012;47(5):360-366. Purpose: To evaluate the effect of bedside barcode medication administration (BCMA) on specific tasks performed by nurses during medication administration in an intensive care unit (ICU). Methods: A prospective observational study was conducted on paper-based medication administration (PBMA) and BCMA in an ICU. A prevalidated time and motion observation instrument was used to measure time spent by nurses on tasks associated with PBMA and BCMA. Frequency of each task performed and mean duration of time dedicated to each task were obtained using descriptive statistics. Analysis of covariance was conducted to assess the difference in time spent with various nursing tasks between 2 periods. Factors considered as covariates were age, gender, body weight, length of stay of the patients in the ICU, number of drugs administered, and number of nurses involved. Results: A total of 101 PBMA and 151 BCMA were analyzed. The mean duration of total medication administration time was found to be significantly higher during BCMA (377.8 ± 232.8 s) than during PBMA (313.3 ± 224.3 s). During BCMA, nurses spent more time on the following medication administration tasks: drug preparation (159.4 vs 27.3 s; P < .05), assisting physician (5.2 vs. 0.4 s; P < .05), universal precautions (3.6 vs 0.0 s; P < .05), and conversing with patients (21.6 vs 15.0 s; P < .05). 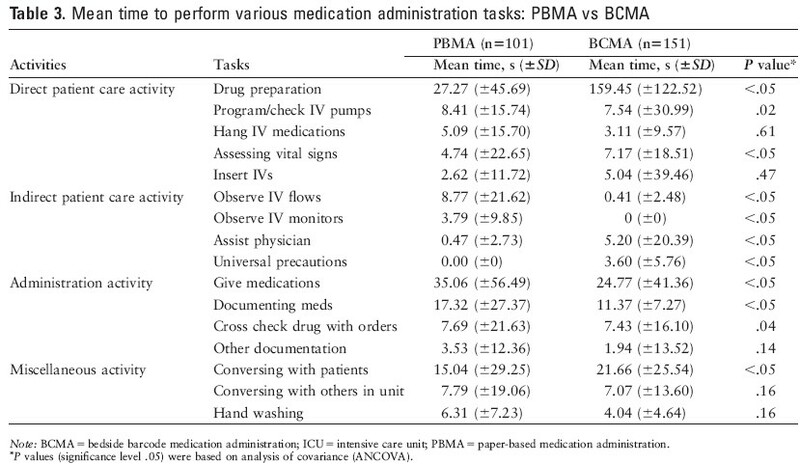 During BCMA, nurses spent less time on the following medication administration tasks: giving medications (24.7 vs 35.0 s; P < .05), documenting medications (11.3 vs 17.3 s; P < .05), and cross-checking drugs with orders (7.4 vs 7.6 s; P = .04). Conclusion: During PBMA, nurses spent more time on documenting medications and less time conversing with patients. This changed significantly after implementation of BCMA. BCMA resulted in nurses spending less time on documentation and more time conversing with patients during medication administration process.